BEIJING — North Korea on Monday expelled three BBC journalists it had detained days earlier for allegedly “insulting the dignity” of the authoritarian country, sending them off on a flight to Beijing. Correspondent Rupert Wingfield-Hayes and his team had been scheduled to leave Friday after accompanying a group of Nobel laureates on a North Korea trip. Instead, the journalists were stopped at the Pyongyang airport, detained and questioned. 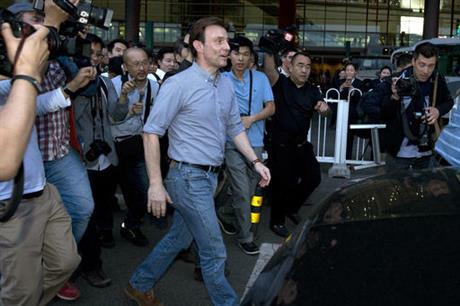 BBC’s journalist Rupert Wingfield-Hayes (centre) walks past journalists as he arrives at the airport in Beijing, China on Monday. O Ryong Il, secretary-general of the North’s National Peace Committee, said Wingfield-Hayes’ news coverage distorted facts and “spoke ill of the system and the leadership of the country”. He said Wingfield-Hayes wrote an apology, was being expelled Monday and would never be admitted into the country again. Another segment included a tour of a modern-looking hospital that Wingfield-Hayes expressed doubts about. “The children we’re shown look remarkably well, and there isn’t a doctor in sight . . . . Everything we see looks like a setup,” he said. About 30 of the journalists finally got a peek at the congress on Monday, for about ten minutes.